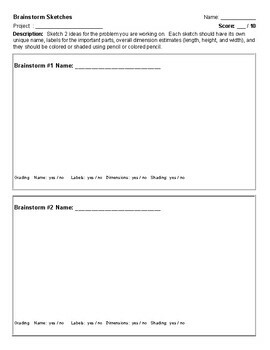 This PDF file is a blank brainstorm sketches worksheet students use to create sketches of initial ideas for a project. There are instructions to explain the assignment, a line for the project title, the student's name, and the score they receive (out of 10 points). It also has a basic grading rubric included at the bottom of the sheet. The grading rubric has categories for (1) the name of each sketch, (2) labeling of the parts, (3) basic dimensions of the design, and (4) shading of the parts.